Where are My Holly Berries? Wait! Where are my holly berries? This is a question we often get in the fall and early winter. 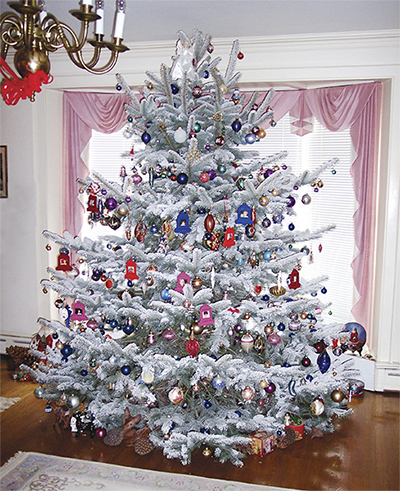 Many people plant holly trees and bushes so that they can cut berry laden boughs for beautiful holiday arrangements both indoors and out. But sometimes they are disappointed when the colorful berries fail to appear. 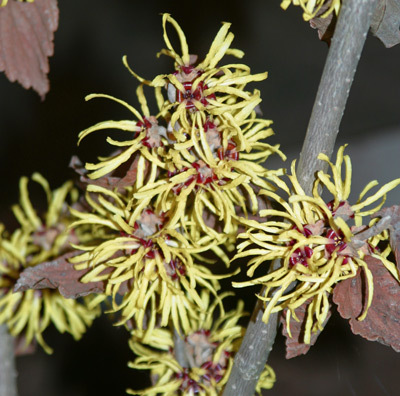 The trouble is, hollies are dioecious plants, meaning the male and female flowers are produced on separate plants. 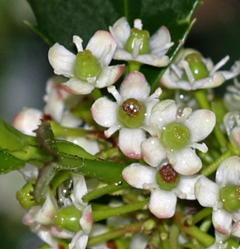 The male holly produces pollen bearing staminate flowers and the female plant produces pistillate flowers which, if pollinated, will normally develop berries. If you only have a female holly and there is no male in the area, you will never* get berries because there is no pollen to pollinate the female flowers. If you only have a male holly, you won’t get berries either – for obvious reasons. This is true of both the evergreen hollies and the deciduous hollies. *There are a few hollies (parthenocarpic species) that can produce berries without pollination but this is not the norm. 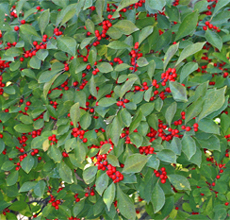 Ilex cornuta ‘Burfordii’ is one holly that does not require pollination for fruit set. If your hollies aren’t producing berries, the first thing to do is to check to make sure that you have both a male and female holly plant. 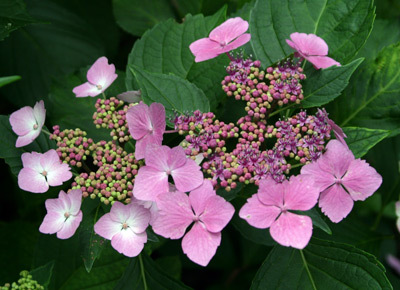 It is best if these hollies are of the same species so that they will flower at the same time. 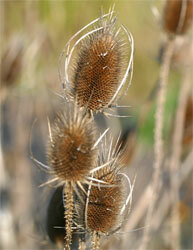 This helps ensure good pollination which should result in a reliable berry crop. If you have NEVER had berries on your hollies, this could be the reason. 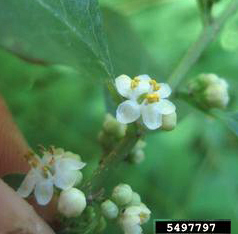 Male flowers of Ilex verticillata showing bright yellow pollen. If you don’t have a label, examining the flowers is a good way to determine whether a holly is male or female. The small, inconspicuous holly flowers appear in the spring. The flowers of male hollies have four (or more) stamens topped with bright yellow pollen. 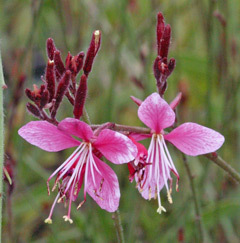 The male flowers are normally borne in clusters (cymes). Female flowers of Ilex ‘Blue Princess’. 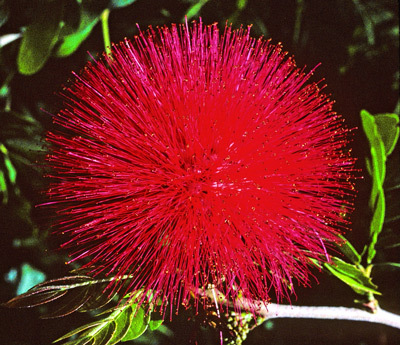 Female hollies usually produce solitary flowers. 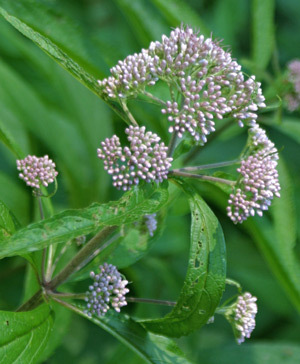 These flowers have a green “berry-like” structure in the center. 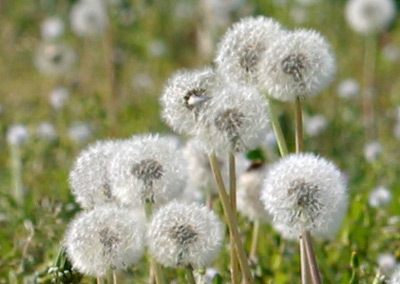 The stigma which receives the pollen is found at the top of this structure. 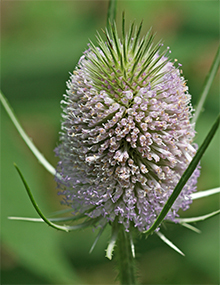 Bees and other insect pollinators carry pollen from the male flowers to the stigma. 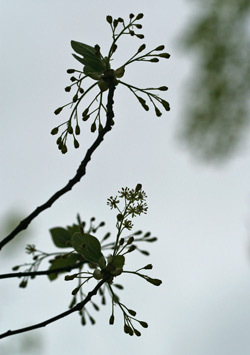 If the flower is pollinated, a full-sized green berry quickly develops – if not, the flower dies and falls off without producing a berry. 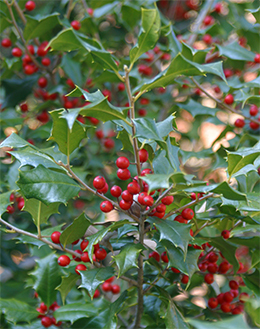 One male holly can serve as a pollinator for multiple female plants. 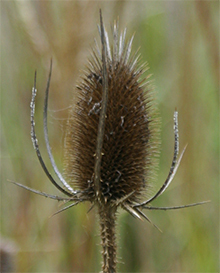 The male should be planted within a few hundred yards of the females. 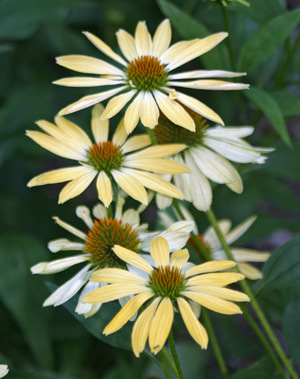 Bees are the main pollinators and will carry the pollen to the female flowers. 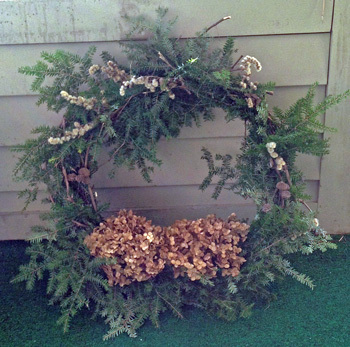 What if you have had holly berries in the past but not this year? Since holly berries were produced in previous seasons, this would indicate that there are both male and female plants present in your landscape. 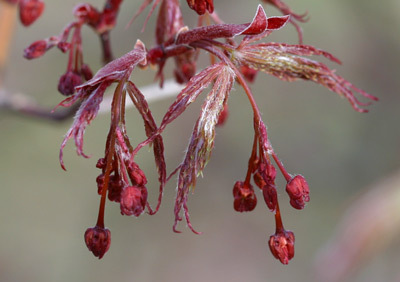 The lack of berry production in one season could be the result of some environmental or weather related issue that affected the pollination of the flowers in the spring. 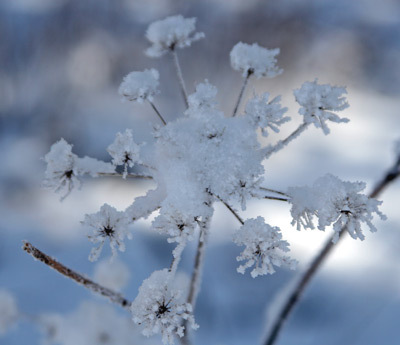 Late frosts or freezes can damage or kill the flowers and result in loss of the berry crop for that season. 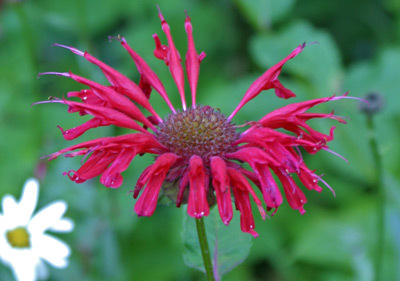 Misty, rainy, or cold weather in the spring at the time of flowering can inhibit or limit pollination because bees are not as active in these conditions. 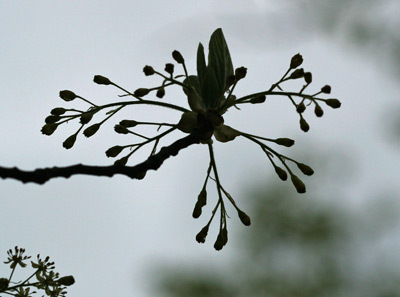 If weather like this persists, it can affect pollination and result in a reduced berry crop. Summer drought can cause berries to shrivel and drop off. Bright red berries of Ilex verticillata in early fall before the leaves drop. Healthy hollies will reward you with a beautiful crop of berries as long as the conditions above are met. Be sure to feed them with a quality organic fertilizer like Espoma Holly-tone in the spring and fall. 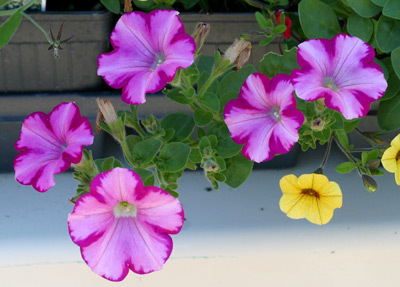 Water them deeply during dry periods in the summer and even in winter if the ground isn’t frozen and it has been dry. 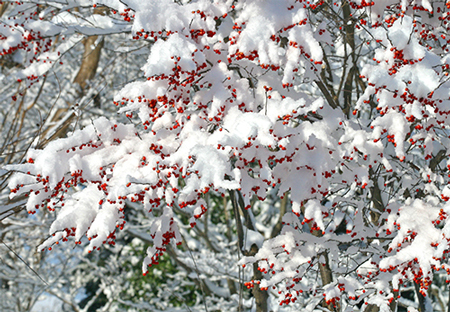 Ilex verticillata ‘Sparkleberry’ in the snow. Beautiful! Last Sunday I snuck into the back of André’s Christmas decorating workshop under the pretense of taking pictures but I mostly just wanted to learn some of the wonderful Christmas decorating techniques that he was teaching that day. 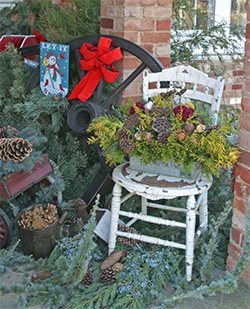 A mix of "greens" adds color and texture to a beautiful holiday display. 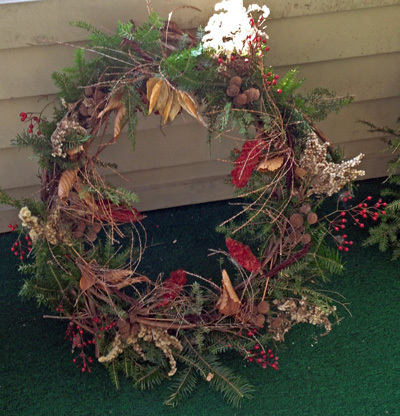 André is amazing (and quick) at making all kinds of festive decorations for the holiday season. 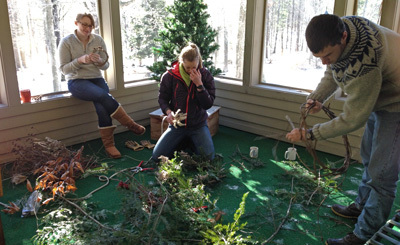 In his workshop, André taught all about using different types of greens, both needled and broadleaf, to create beautiful outdoor displays, as well as centerpieces, wreaths, kissing balls, and roping. He made it look so easy and really it is if you know some of the tricks of the trade. 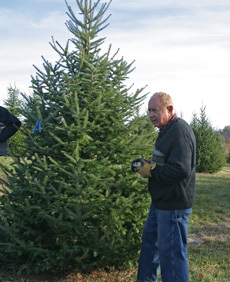 All the boughs were fresh cut for use in the various arrangements he would create for the holidays, while at the same time benefiting the trees and shrubs through some thinning (never taking more than 10% when cutting for greens). After they were cut, all the greens were sprayed with Bonide Wilt Stop to help keep them fresher and reduce needle drop even when they are kept indoors. 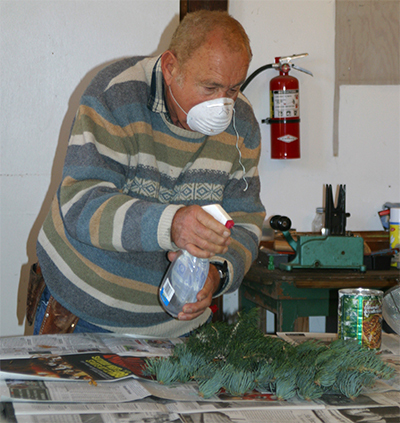 He sprays his Christmas trees with Wilt Stop before he brings them inside, too. 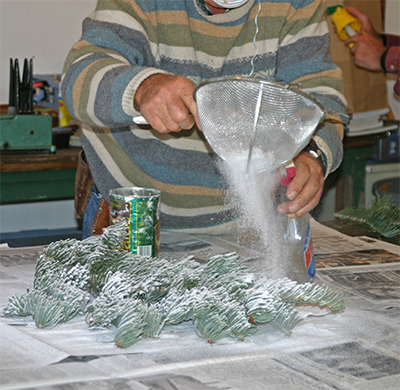 The “snow tree” is also sprayed before it is flocked. 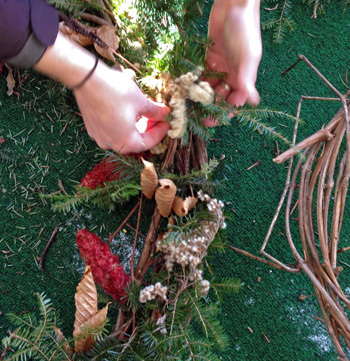 There were so many different colors and textures – the word “greens” is really misleading! Beautiful blues, silvery blues, and golds joined the greens in André’s stock pile of plant material all waiting to be turned into beautiful holiday arrangements. 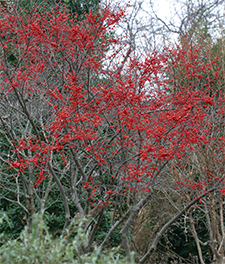 Ilex 'Sparkleberry' provides a brilliant splash of color in the winter garden. 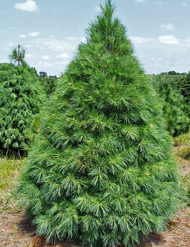 “Plan NOW to add a few of these beautiful evergreens to your landscape,” he suggested. 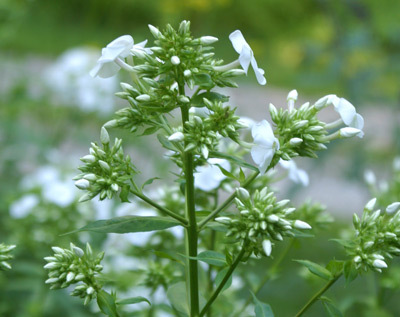 “By the time spring rolls around, you will have forgotten all about the holidays and needing greens for decorating!” In some areas, it’s not too late to plant even now. 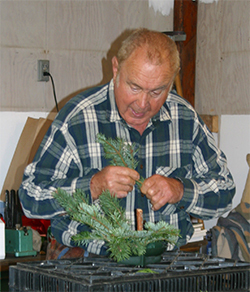 “If you plant a new evergreen each year, in a few years, you will have all the fresh greens you need.” Some of André’s favorites for decorating are Concolor Fir, Nordmann Fir, George Peabody Arborvitae, Gold Mop Cypress, Scotch Pine, juniper, holly, and boxwood. For bright accents in his arrangements, he likes nothing better than the berry laden branches of Ilex ‘Sparkleberry’, a cultivar of the deciduous holly, Ilex verticillata. Another good variety according to André is Ilex ‘Maryland Beauty’. To me, these ‘Sparkleberry’ branches really make the display! Before he began his demonstration, André gave us another tip; “I don’t wear gloves when I do my arrangements, so before I start, I always apply a good layer of hand lotion to my hands. This keeps the pitch from sticking to them. Everything washes right off!” Great advice! Andre strips off the lower needles before sticking the greens in the oasis. A branch stub holds the place for the candle. 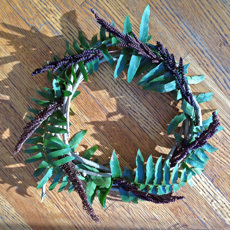 André first showed us how to create a beautiful centerpiece for a table. He warned us not to make it too large – “Always start out making it smaller than you want because in the end, it will invariably turn out much larger than you thought it would!” He began with a water-saturated block of oasis cut to fit into his container, then he snipped short pieces from his stock pile of cut boughs and set them aside. 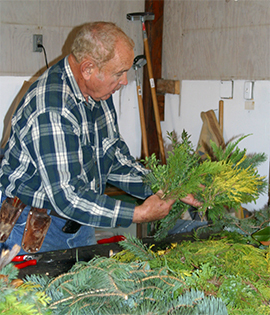 When he had a nice variety of greens ready, he began to create his arrangement. 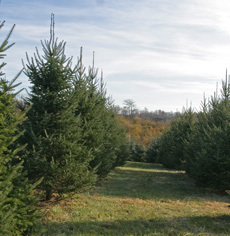 The lower needles were stripped off the branches and then poked into the oasis. He poked and turned, poked and turned, and before long he had a lovely centerpiece full of colorful greens and many different textures. 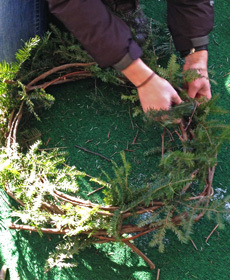 A handful of mixed greens ready to wire to the wreath form. 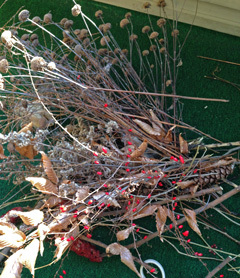 For a finishing touch, he added some peony and Siberian iris seed pods, some dried Achillea flowers, a few pine cones, a red candle in the center, and just like that he was finished. The whole thing took him about 10 minutes even with explaining the process to us. Of course he’s been doing this for many years! 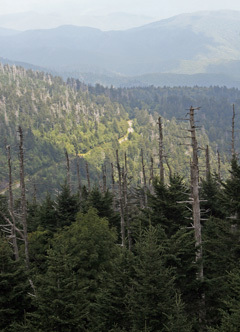 This arrangement could even be flocked with snow after it is finished. 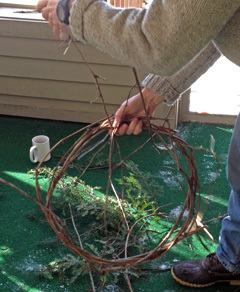 He went on to show us how to make wreaths and roping by taking handfuls of mixed greens and wiring them in overlapping layers onto either a wire ring (for a wreath) or some heavy twine (for roping). Andre shows the wreath almost half finished. A beautiful mixture of greens adds color and contrasting textures. Each successive layer was laid down so that it overlapped and covered the cut ends of the previous layer. 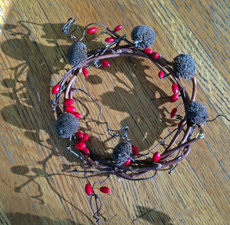 Florist wire from a spool was wrapped tightly around the ends and the wire ring securing it all together. The cut ends of the final layer were tucked under the first layer and carefully wired to the ring so no wire showed. I always wondered how that was done! 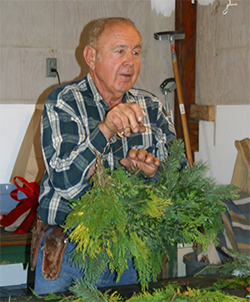 The pièce de résistance was when André demonstrated how to flock an evergreen bough. 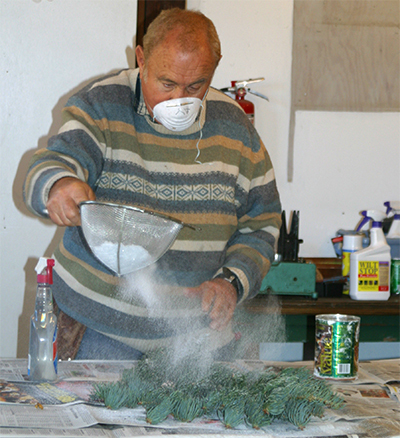 Every year André creates a beautiful “snow” tree for his home and every year when people see it they ask us how to do it. 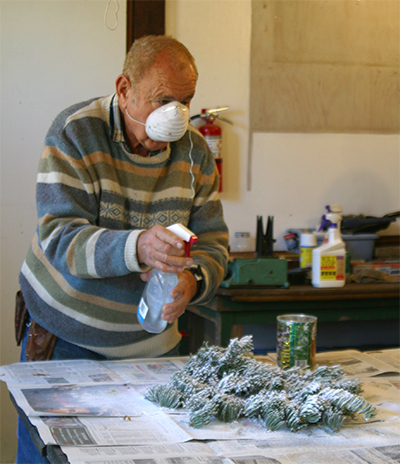 This year for the first time, he decided to add this demonstration to the decorating workshops. The hardest part is finding the flocking material, a mixture of cellulose fibers, mica (for sparkle), and glue. Flocking should NEVER be done inside the house. Always wear a good quality dust mask while you work. Be sure to carefully cover the surface you are working on with newspaper to protect it – this flock will stick to anything! 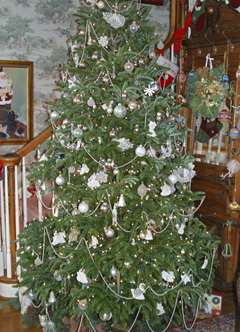 The first step is to wet the boughs with water. A spray bottle (with a mist setting) filled with water is the easiest way to accomplish this. ALWAYS wear a mask to avoid breathing in the flocking material. 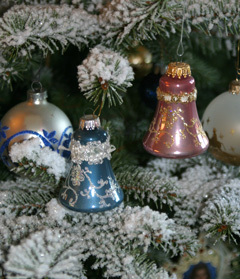 Using a sieve, sprinkle the flocking lightly over the evergreen boughs. 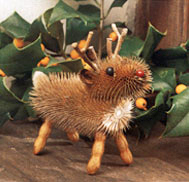 It will stick to the moistened needles. 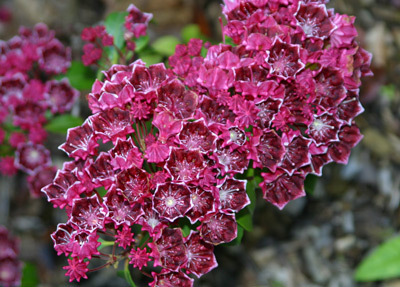 To add more layers of flocking to the bough, spray the flock with a mist of water as it falls from the sieve. This will activate the glue and allow the flock to stick when it lands. When you are satisfied with the amount of flocking on the branch, mist the whole branch with water to set the flock. Once the whole thing is completely dry, it can be brought inside. André's beautiful "snow tree". It takes a lot of flocking and quite a few hours to create this beautiful effect but it is well worth the time!